Born in 1966 to parents of Scottish descent, Walker grew up playing ice hockey and dreamed of a career in the NHL as a goaltender, only playing baseball for fun during the summer. At the age of 16, he was offered tryouts with Junior A teams in Regina, SK and Kelowna, BC, but after getting cut from both teams, Walker decided to focus his athletic aspirations on baseball. Walker was selected to join the Canadian team at the 1984 World Youth Championships in Saskatchewan. At that tournament, he caught the eye of Montreal Expos scouting director Jim Fanning, who signed Walker for $1500, despite Walker's relative lack of experience playing organized baseball. Although he could hit fastballs well, Walker was unprepared for the more sophisticated pitches he encountered during his first season as a professional with the Utica Blue Sox and struggled at the plate, finishing with a .223 average and only 2 home runs. Walker feared he would be released, but Expos hitting coach Ralph Rowe successfully argued that Walker should be sent to the Florida Instructional League. With further tutelage, Walker soon developed into one of the Expos' best young prospects, overcoming a serious knee injury along the way. Walker made his debut with the Montreal Expos on August 16, 1989. He walked twice and recorded a single in his first official at bat. During his first several seasons, he was an above average hitter in all respects, hitting for some power, stealing 20–30 bases, and regularly batting near the .300 mark, becoming a role model for thousands of young Canadian baseball players. He became the first and only Canadian to win the Expos Player of The Year, doing so in 1992. In 1994, Walker was well on his way to his first 100-RBI year, with 86 RBI. However, that season was interrupted due to the 1994 players' strike. Before the 1995 season, Walker signed with the Colorado Rockies. In 1995, Walker was a major factor in helping Colorado reach the playoffs for the first time, hitting .306 with 36 home runs and 101 RBI. He remains in the top ten in many offensive categories for the Rockies. Walker's career season came in 1997, when he hit .366 with 49 home runs, 130 RBI, 33 stolen bases, and 409 total bases, en route to becoming the first Canadian player to win the MVP Award. He became and remains the only player to have at least 25 stolen bases and a slugging percentage of more than .700 in a season. Walker's 409 total bases in 1997 were the most in an NL season since Stan Musial's 1948 season, although the mark was bettered by Sammy Sosa in 1998 (416). In 1998, Walker won the Lou Marsh Trophy as Canadian athlete of the year after finishing runner-up the previous year to Formula One champion Jacques Villeneuve. He won the Tip O'Neill Award as Canada's top baseball player 9 times in his career. Only Walker and Joey Votto have won it more than 3 times in their career. Combined with 12 outfield assists, the season remains one of the finest all-around performances in recent baseball history. Even more impressively, Walker's breakout season came just one year after various injuries limited him to 83 games and 272 at-bats, although the NL Comeback Player of the Year award went to Darren Daulton. Walker was plagued by injuries for the last several years of his career, nevertheless continuing to produce. Although he would never have 500 at-bats in a season after 1997, he hit .363 in 1998 in limited action, and .379 (a Rockies record) with 37 homers and 115 RBI in just 438 at-bats the following year. After spending most of the 2000 season on the disabled list (albeit hitting .309 in limited action), Walker returned to form, hitting .350 and .338 the next two seasons, with more than 100 RBI both years. In July 2004, the Texas Rangers agreed to send the Rockies then-minor-leaguer Ian Kinsler and prospect right-hander Erik Thompson in exchange for Walker, but Walker vetoed the trade. 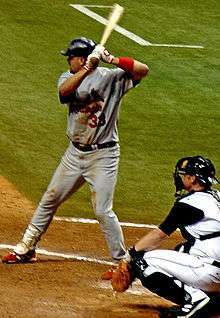 In August 2004, Walker, who was batting .324 despite being injured, desired a trade to a contender. He went to the St. Louis Cardinals for three minor league players. Now playing for the Cardinal powerhouse, Walker contributed briefly to the pennant-winning 2004 squad and the 2005 division winners. The Houston Astros defeated the Cardinals in the 2005 NLCS in the last game ever played at Busch Stadium. Walker retired shortly afterwards. He ended his career 50th on the all-time home run list with 383. As of 2008, Walker is an instructor on the St. Louis Cardinals' spring training staff under manager Tony La Russa and does fill-in training with the Cardinals staff. He was offered a full-time position but chose to remain in his part-time position. In 2009, Walker served as Team Canada's hitting instructor at the 2009 World Baseball Classic and was inducted into the Canadian Baseball Hall of Fame. In 2011, he also served as Hitting Coach/First Base Coach for Canada's Gold Medal winning team at the Pan Am Games in Guadalajara, Mexico. He became eligible for induction into the National Baseball Hall of Fame in 2011. During his first year of eligibility, he received 118 votes, or 20.3 percent of all ballots cast; the threshold for entry is 75 percent. A major negative for voters in considering Walker for the Hall Of Fame is the inflation of his hitting numbers playing at Coors Field. Walker and his wife Angela have two daughters – Canaan Rose-Lynn (born 1999) and Shayna Kaitlin (born 2001) – and he has another daughter, Brittany Marie (born July 1993), from a previous relationship. Walker enjoys playing and watching soccer. His theme song is "Crazy Train" by Ozzy Osbourne. Walker is superstitious about the number three. He wore number 33 and was married on Nov. 3 at 3:33. He would take three, or any multiple of three, swings in the batter's box before he would hit. ↑ Bloom, Barry (January 5, 2010). "Cooperstown calls for Alomar, Blyleven". MLB.com. Retrieved January 5, 2011. ↑ The ESPN Sports Almanac. ESPN Books. 208. p. 529. ISBN 1-933060-38-7.